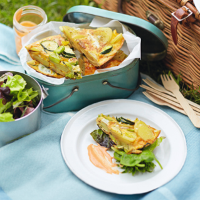 This vegetarian tortilla tastes great served warm or cold so is ideal for picnics - weather permitting! 1. Heat half the oil in a large non-stick frying pan and add the sliced potatoes, salad onions and seasoning. Cook over a medium heat for 6–7 minutes, turning the potato slices to allow them all to cook through. Once the potatoes are tender, push to the side of the pan, add the courgettes then turn up the heat and cook for a couple of minutes, turning once, until golden. Add the broad beans and toss together to coat in the oil. 2. Beat the eggs in a bowl with some seasoning then add the hot vegetables from the pan and mix thoroughly. Heat the remaining oil in a 20cm non-stick deep frying pan until hot and pour in the egg mixture. Stir with a fork, lifting the middle of the tortilla to let the runny egg down into the base. Cook over a medium heat for 3-4 minutes until the tortilla is just set and the base is golden. 3. Place a large dining plate over the pan and carefully invert to tip the tortilla out onto the plate, cooked side uppermost. Carefully slide the tortilla back into the pan to cook the other side, until the whole thing is golden brown and cooked through. Turn onto a plate. Mix the garlic mayonnaise with the harissa paste and serve with the sliced tortilla and a green salad. More info: 15.4g protein, 3.2g fibre.